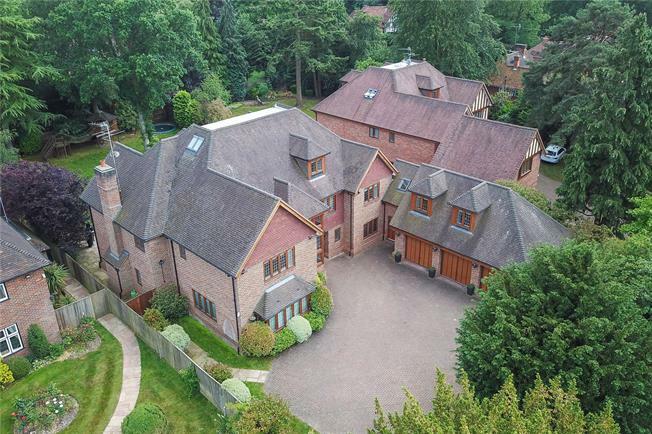 7 Bedroom Detached House For Sale in Gerrards Cross for Guide Price £2,500,000. Constructed by renown local builders Mentmore Homes, this property offers large rooms, spacious bathrooms and a stylish galleried landing. There are six/eight bedrooms, six reception rooms and six bathrooms over three levels. A self contained annexe is perfect as a nanny or guest suite. In addition, the property has a sauna, steam room, a walk in fridge, surround sound music system, under floor heating and electronic lighting system. The property is located approximately half a mile from the amenities of central Gerrards Cross, which include good day to day shopping, M&S Simply Food, Waitrose, Tesco, Sainsburys Local & an independent supermarket, a variety of restaurants, Everyman cinema & community library. The Chiltern Rail Line links Gerrards Cross rail station to London Marylebone (fast services taking approximately 18-20 minutes). Attached triple garage with gymnasium, playroom/bedroom above. Block paved driveway to the front with parking for several cars, lawned surround all set behind remote operated wrought iron gates. Private rear garden is enclosed and mostly laid to lawn with a wide paved terrace. Plot appraoches 0.4 of an acre (in all).